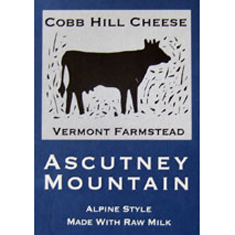 Ascutney Mountain Cheese is a sweet and nutty cheese similar to European Alpine cheeses like Gruyère, Appenzeller, or Raclette. By four months, a mild, clean Swissy flavor is present, balancing the butteriness of our rich Jersey cow milk, but most wheels are aged 8 to 10 months to develop more complex character. Ascutney Mountain Cheese has a firm yet creamy texture, with tiny eye (holes) scattered throughout the interior. Wheels weigh between 8 and 12 pounds, are 11″ in diameter, slightly domed, and 3″-5″ high. Rinds on young cheeses are the color of straw, but by 4 months they develop a thin coat of crusty gray or white, a sign of a happy relationship between the raw milk product and its environment. Four Corners is a brined cheddar with a natural rind, a slightly crumbly texture and a strong, tangy flavor that is best at three months. The exterior of Four Corners ranged from gray to orange, and sometimes reveals the outlines of the cubes that filled the cheese form. Four Corners is 11″ in diameter, 2″ to 4″ high. Cedar Mountain, a mixed farming enterprise owned and operated by Stephen Leslie and Kerry Gawalt, produces raw milk and vegetables and flowers for local markets and their CSA (“Community Supported Agriculture”). Because of restrictions on sales of raw milk to consumers, our milk purchases are a critical economic component for this small farm, enabling the farmers to include manure in their management of the soil cycle. Cobb Hill Cheese is a manufactured entirely with milk from Cedar Mountain’s herd of about fifteen Jersey cows. We share our facility with the dairy, and communicate daily with the farmers. From May through November, we observe the effects of the changing pastures on the character of the milk and the cheeses that result several seasons later. In winter, our cows eat hay harvested from our own pesticide-free fields, stored in a dry hayloft, not a plastic bag. Cobb Hill Cheese welcomes visitors as viewers or participants. It is essential to call ahead and arrange a time. All the partners in Cobb Hill Cheese and Cedar Mountain are members of the Cobb Hill Cohousing Community, an experiment in sustainable development and community living on 270 acres in Hartland Four Corners, Vermont. The group of 23 households is commited to land stewardship, and most members are active in one or another land-based project, whether it be cheesemaking, farming, forestry, landscaping, sugaring, or raising kids to raise chickens and haul wood for our large woodburning furnace. You can read more about life at Cobb Hill at the community’s website. Cobb Hill Cheese is sold on the farm as well as in many local coops and small stores and the Norwich Farmer’s Market. During the summer, there is a twice-weekly farmstand where you can purchase cheese, fresh vegetables, maple syrup, and more. Call for hours. Please leave a clear voicemail message with contact information for a return call. Similar to its Welsh namesake, a brined cheddar with a natural rind, a slightly crumbly texture and a strong, tangy flavor that is best at three months. The exterior of Four Corners ranged from gray to orange, and sometimes reveals the outlines of the cubes that filled the cheese form. 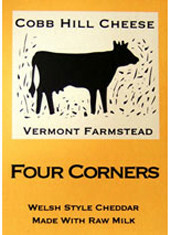 Four Corners is 11″ in diameter, 2″ to 4″ high. For more information on where to purchase, click here. 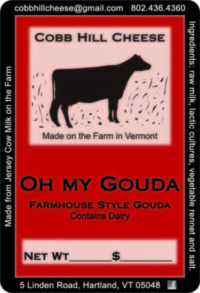 The Vermont Cheese Council represents cheesemakers throughout Vermont who are dedicated to the production and image of premier cheese. Our mission includes hosting educational events for the public and food professionals in order to learn more about the art and science of artisan and farmstead cheeses made in Vermont.